We are always looking for resources to make our lives easier. I have found one that has a lot of potential. Last week EverySlide.com came across my radar. In the little amount of time I have played with it I have to say I am very impressed. Everyslide is a free service that allows you to upload and share your PowerPoint or PDF presentation online to other devices while you are presenting. All that is needed for you to share is the URL they provide you. Anyone else with an internet capable device is able to view and interact with your presentation as you go. Each slide is touch interactive, so you can ask your audience to click on their screen to answer a question…possibly a map you have showing. The program compiles the data and will then display it as “hotspots” on your map. The more clicks an area gets the darker the spot becomes. Fast and easy. When you log in, your landing page is simple and to the point. 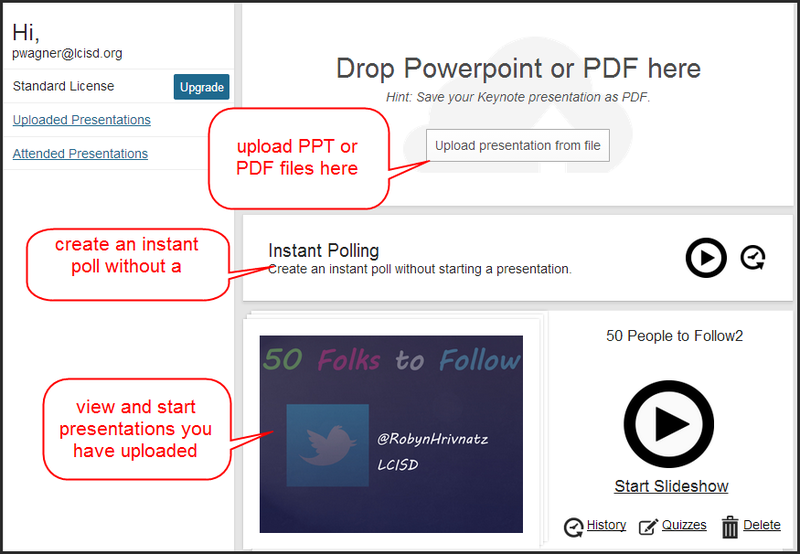 Upload your file(s) to the site and start the presentation online. There is also an option to create an instant poll without even starting a presentation. We will look at instant polls a little later. Move between slides with the arrows in the upper left. Each participant has the ability move back to previous slides from their device but they cannot move ahead of where you are in the presentation. 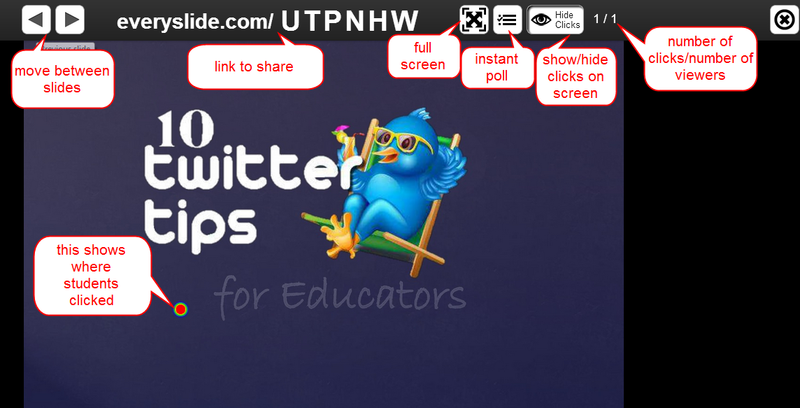 Show/hide the collected clicks on the screen by your participants. If you look toward the lower left you will see a red dot. That is where I clicked as a participant. As more click you will see the dots populate. The two numbers will show the number of clicks vs the number of viewers. You quickly can tell how many people are following along and how many have made a selection. The instant poll option is a great resource as well. You have 120 characters to use for a question. Choose from true/false, multiple choice, or a word cloud. Once you start the poll your question will be displayed on everyone’s screen. Everyslide will collect the data and give you an option to display the results as the poll is underway. Stop the poll at any time. This is a great way for you to get a quick feel for understanding. I am very excited about the possibilities that this site can offer. 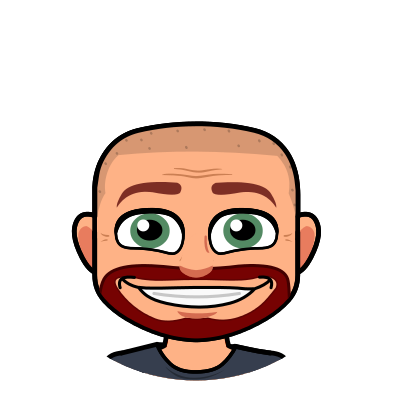 If you are in a BYOD or 1:1 atmosphere you instantly have a way to collect real time data and put your information in the palm of your students’ hands.